WHO’S NEXT TO SCALE THE 700 HOME RUN MOUNTAIN? 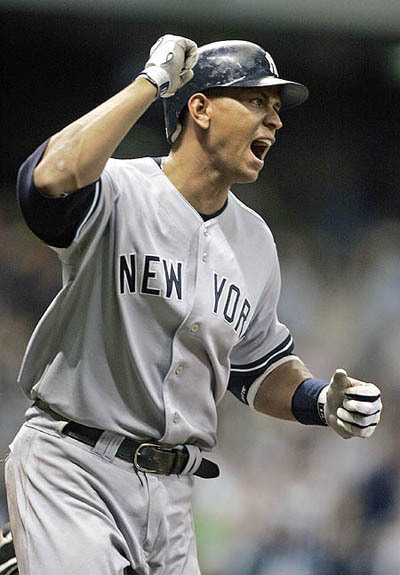 On June 20, 2004, as Alex Rodriguez was told that his buddy Ken Griffey Jr. had just hit his milestone 500th homer against the St. Louis Cardinals. Rodriguez and Junior, of course, were teammates in Seattle until Griffey was traded to Cincinnati after the 1999 season. "I'm very happy for him. It's very exciting," Rodriguez said. "I think 500 is a nice feat, but I still believe he's going to go to 600 and 700 next...I really do. I think he's still young enough. I think deep inside he really wants to make a run at something significant. That's my thinking." A-Rod was right about the part where Junior would hit 600 home runs (he currently stands at 630), and now that Seattle has re-signed “The Kid” for what will be his 22nd MLB season – see Griffey To Return for 2010 – Griffey will be back slugging fastballs out of Safeco Park and other stadiums around the league in his continued pursuit of the vaulted 700 home run mark. 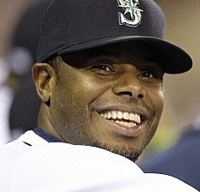 "I'd like to thank the Mariners organization for inviting me back to play in 2010," said Griffey. "While 2009 was an awesome experience for me, my ultimate goal is for the Mariners to get to and win the World Series. I look forward to contributing in any manner I possibly can on and off the field." 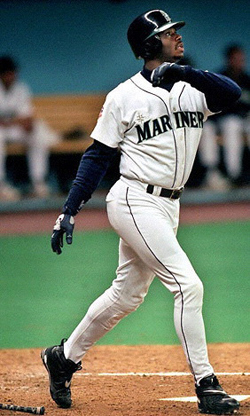 Griffey, a 10-time American League All-Star (1990-99) who was named MVP of the 1992 All-Star Game and won three Home Run Derby's (1994, 1998, 1999), can’t wait to take the field again with the league’s most improved team (The Mariners improved 24 wins from 61-101 in 2008 to 85-77 in 2009). Of course A-Rod has his eye on the prize too. On August 4th 2007, just days after turning 32, Alex Rodriguez gave himself one of the most amazing late-birthday presents possible when he earned admission into The 500 Home Run Club®. At 32 years and 8 days of age, he bested the previous youngest-ever club member – “The Beast” Jimmie Foxx – by nearly an entire year (Foxx did it in 32 years, 338 days). He went on to become by far the youngest Major Leaguer to hit 300-400-500 and (dare we say 600) round-trippers. If history serves, and foreseeing any off-season injuries, A-Rod (who is just 17 dingers shy of the 600 plateau) will still be 34 when he hits number 600 sometime next mid-season. Editor’s Note: The next fastest to 600 was Hammerin’ Hank Aaron, who was 36 years and 196 days old when he broke through the 600 HR ceiling and 39+ when #700 went flying into the cheap seats. Not only was Babe Ruth the first major leaguer to hit 700 home runs, but he is still the youngest to do so at 39 years + 150 days. Hank Aaron took 16 days longer (39 years + 166 days) and Barry Bonds was 40 years + 55 days. Based on A-Rod’s 44 home runs for every 162 games average, the 34 year-old will surpass 700 home runs at age 36 or 37…either way he would be years younger than anyone else on the list. Rodriguez’s talent, training regimen, excellent supporting Yankee cast, and his burning desire to be the best virtually guarantee that he is going to pass every player ahead of him…and eventually take over the top spot on the all-time home run list.